Bob and I had been at Grand Canyon National Park for a few days, and on top of exploring the phenomenal panoramic sights, we had also been engrossed in the observation of a variety of bird species. 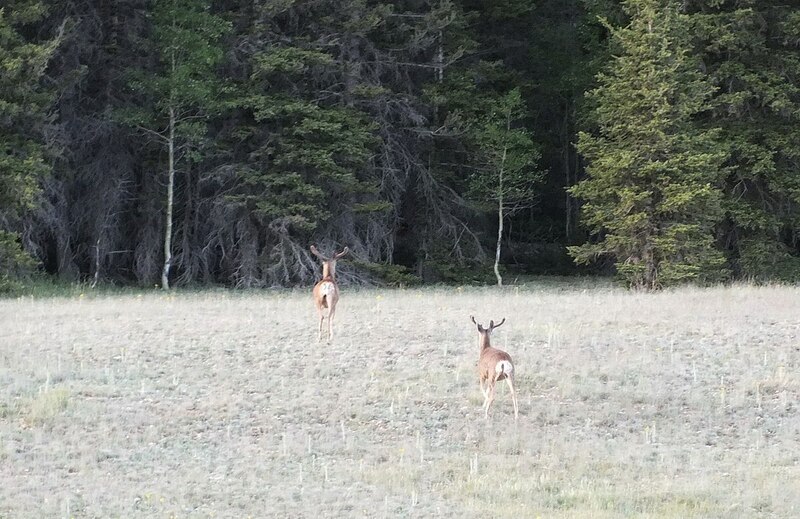 It was not until the morning of a guided Fossil Hike that we first came upon some Mule Deer (Odocoileus hemionus). 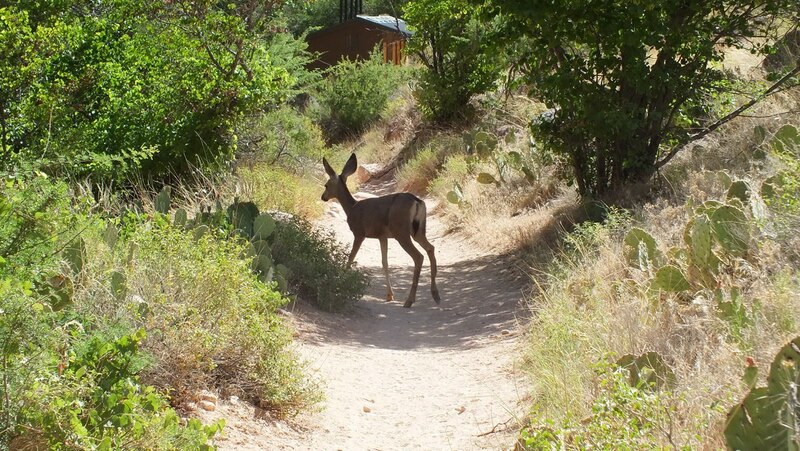 People wanting to join the hike were to assemble on the canyon-side patio of Bright Angel Lodge, and there, just below the stone wall edging the pathway, a family of Mule Deer was having its breakfast. 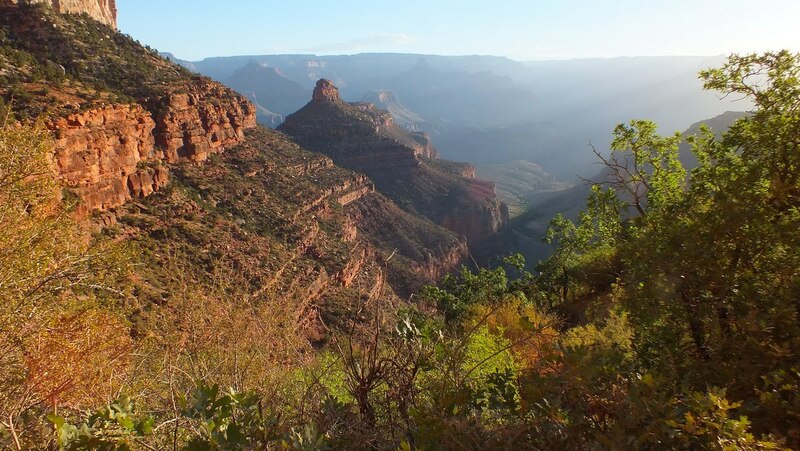 The Canyon was aglow with early-morning sunshine, so we took our time enjoying the view as we made our way from Maswik Lodge to the rallying point for the guided walk. Despite our being out and about the trails and village for most daylight hours of the previous few days, we were oblivious to the large numbers of Mule Deer that inhabit Grand Canyon National Park because, oddly enough, they had remained out of sight. 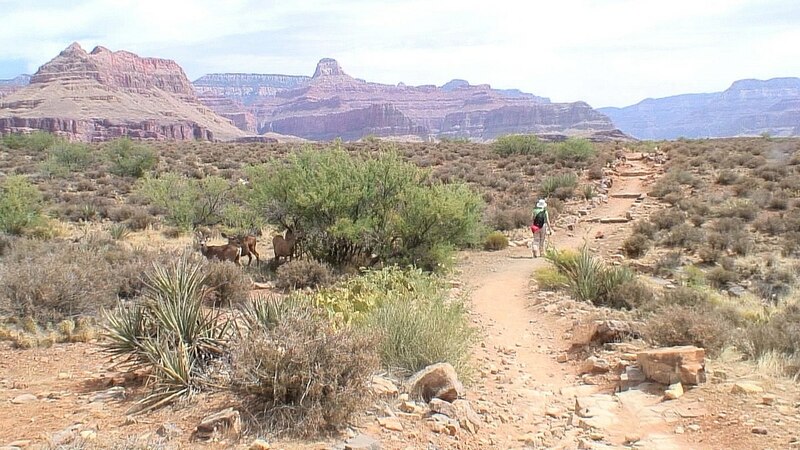 It was quite the surprise, then, to see a pair almost at arm’s reach below the South Rim Trail. Inching along narrow paths forged by the wildlife, this young Mule Deer and its mother had found some tasty bushes to munch on. 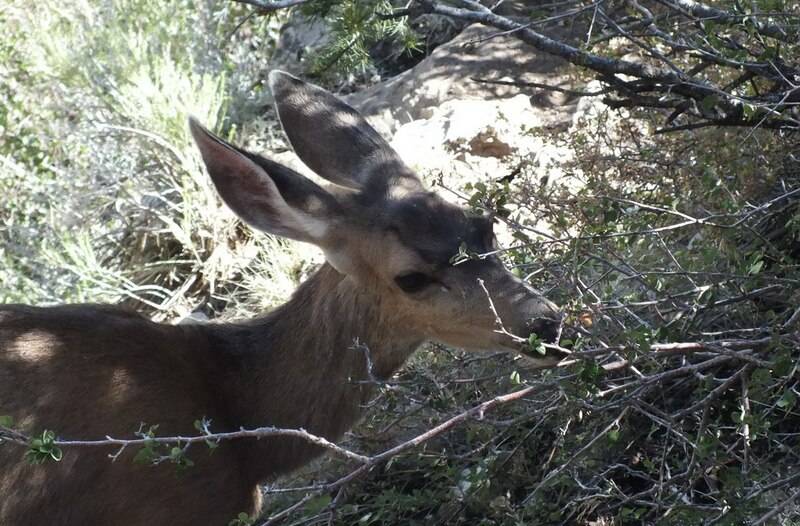 Mule Deer eat a variety of vegetation, but being browsers, the majority of their diet consists of either weeds or leaves and twigs of woody shrubs. These may include mesquite leaves and beans, a flowering shrub known as Fairy Duster, Jojoba, and Cat Claw Acacia, to name a few, but one thing they seldom eat is grass. 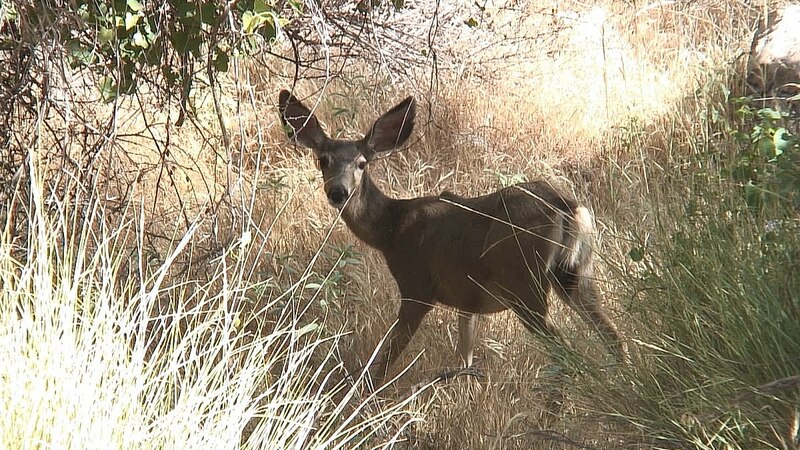 As I observed this young Mule Deer, I was struck by the size of its ears. Mule Deer get their name from the fact that their ears are very large and resemble those of a mule, but to actually see these deer with their over-sized ears made me giggle. My first thought was of Dumbo the Elephant. Normally, a Mule Deer’s ears are equal to 3/4 the length of its head. 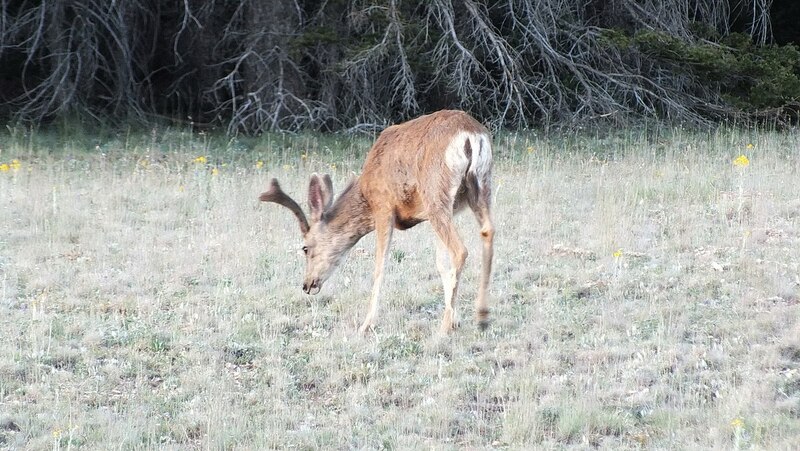 In my photo, you can also see the distinctive black forehead that contrasts sharply with the deer’s light grey face. 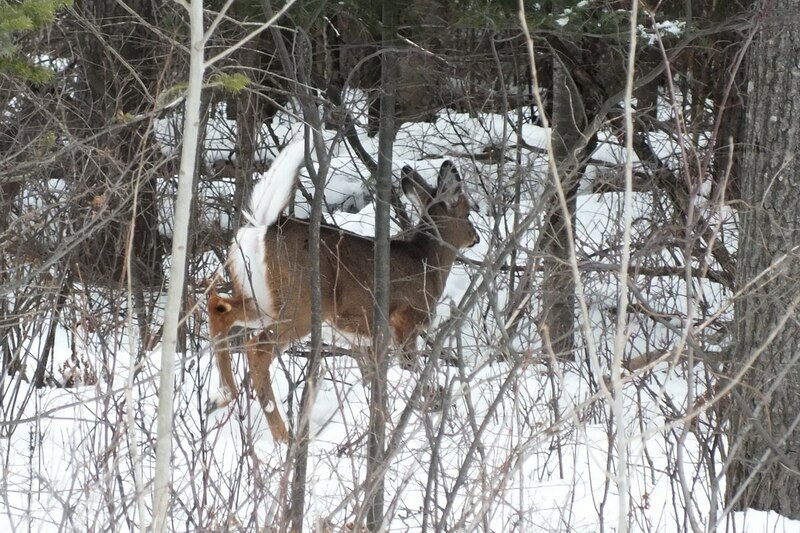 It was also impossible for me to miss noting the deer’s distinctive tail. 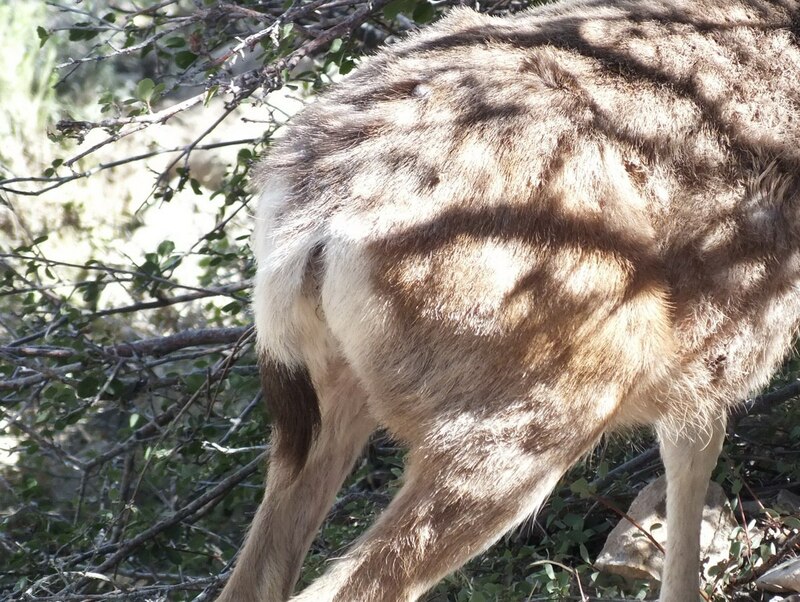 Unlike the large tails on White-tailed Deer (Odocoileus virginianus), common at home in Ontario, the tail of the Mule Deer is small, and white like the rump patch, but it is set off by a black tip. A Mule Deer’s tail can be anywhere from 4.6 to 9.0 inches long, and it is carried in a drooped position. 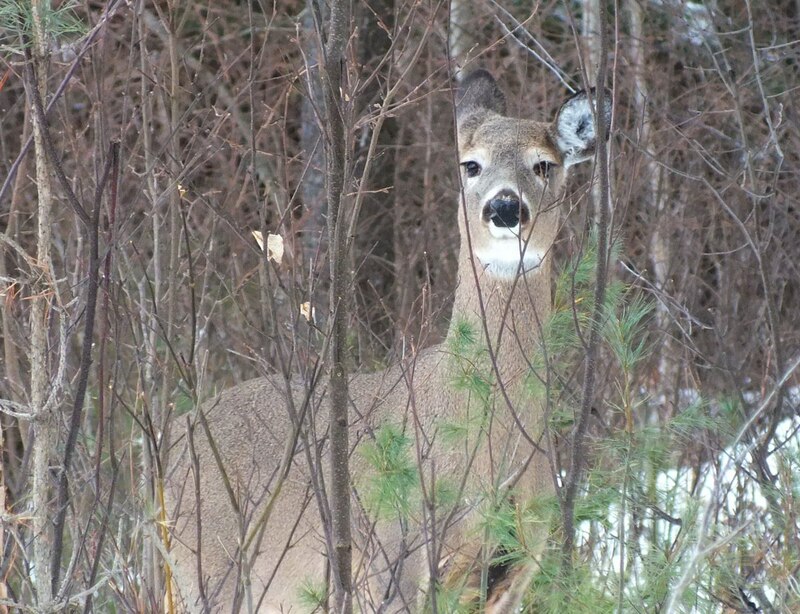 In the forests near Oxtongue Lake, Ontario, where I was born and raised, White-tailed Deer are a very familiar sight. 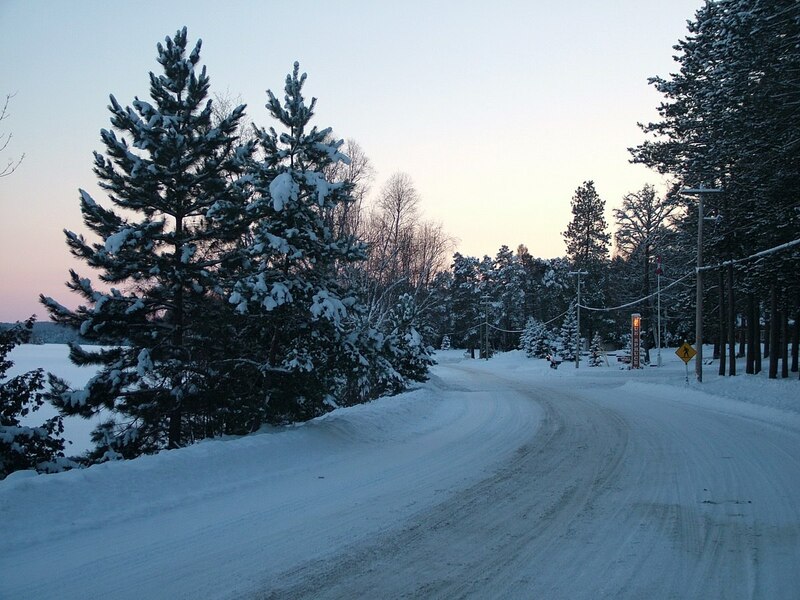 As Bob and I hiked through the woods near Oxtongue Lake on one occasion, we spooked a young deer that immediately took off on the run but simultaneously lifted its white tail as a warning to any other deer in the area. That action is called “flagging”. Mule Deer do not flag their tails, but instead escape danger using stiff-legged jumps that have them bouncing up and over rugged terrain. This action is called “stotting”. All 4 hooves push off the ground at the same time, and in one bound, a Mule Deer can travel a distance of 15 feet over thick brush, at a height of 2 feet, giving the deer a good vantage point for planning its escape and allowing it to out-distance its predators. You will also note that the ears of the White-tailed Deer are much smaller in size compared to those of the Mule Deer, an advantage when it comes to enduring -40F. temperatures during the winter months. They are less prone to frostbite. As Bob and I proceeded along the South Rim Trail, the pair of Mule Deer sauntered along in the same direction, nibbling at leaves and twigs along the way. They were totally unfazed by the collection of people lurking above them. They, too, had been drawn to the edge of the trail for a look. When we heard the rallying call from the Park Ranger who would be leading the Fossil Hike, we had to abandon our morning’s wildlife viewing for the present time. 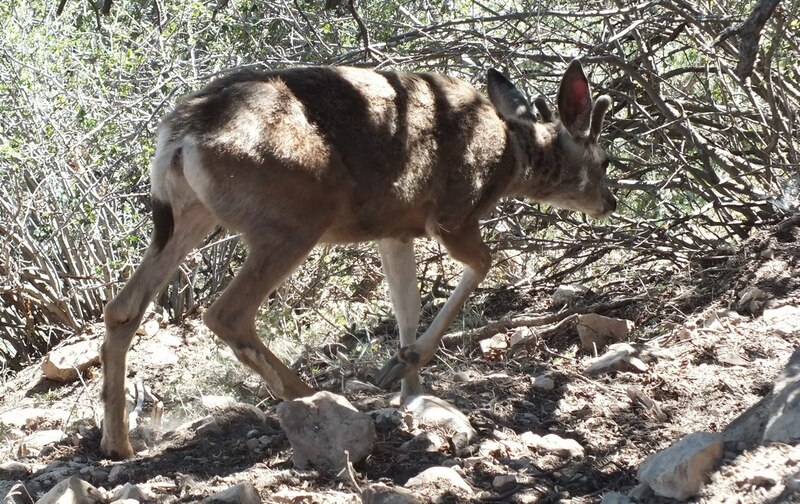 A few days later, when Bob and I were three hours into our hike down the Bright Angel Trail, we were startled by the appearance of a Mule Deer just off to the side of the trail. It appeared to be surprised by our presence, too, even though other hikers had passed that way ahead of us. Like a lot of animals in that arid environment, Mule Deer are most active early in the morning, at dusk or even on moonlit nights. We commenced our hike at 5 a.m. so it was no surprise to come across this Deer feeding during the cool early morning hours. Our hike began on the South Rim of the Grand Canyon, at the trailhead of Bright Angel Trail, located on the lip of the canyon at the top of this photograph. 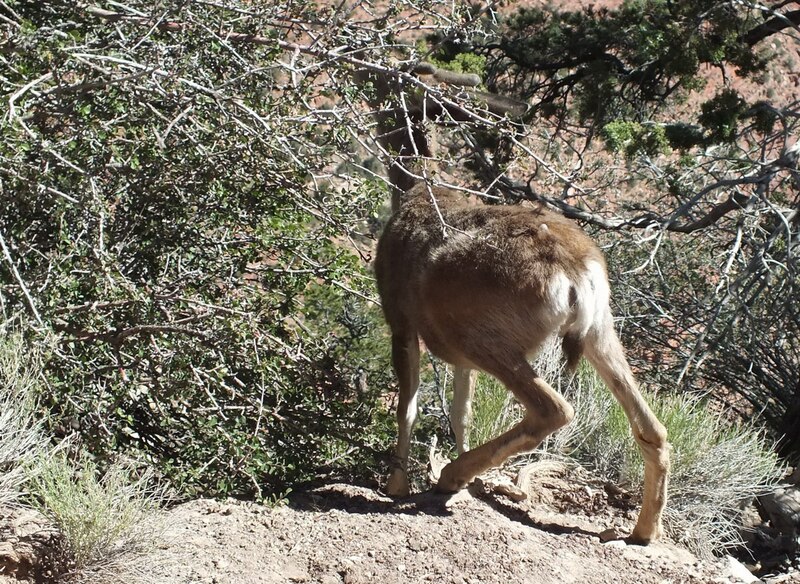 Even though we were descending into the Inner Canyon, care had to be taken because of the steep decline and sharp drop-offs, so it was at about 8:30 a.m. when we saw the Deer, at about Mile 4 from the outset. It was a little easier negotiating the trail from that point on towards Indian Garden because the surface was more level, but even though it was still fairly early in the morning, the temperatures were scorching. Indian Garden is an oasis that promised a welcome reprieve from the heat. A spring-fed river is the source of water at the oasis, a rarity in that desert world. 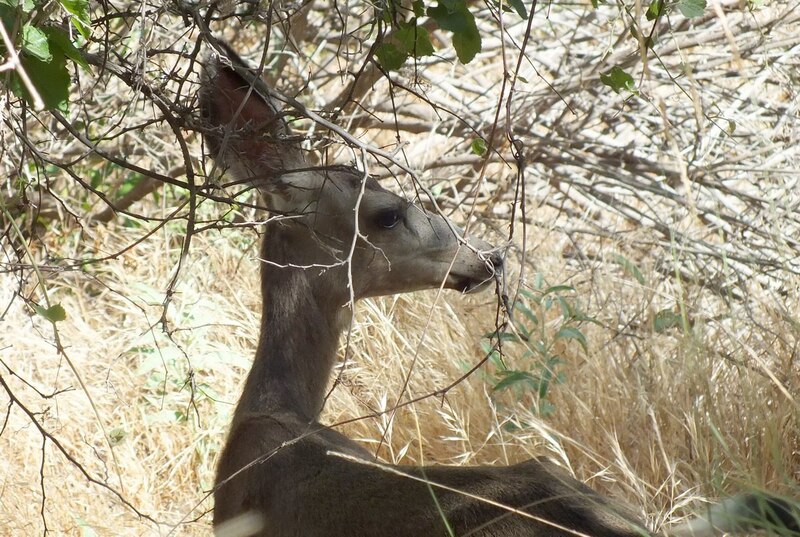 It seemed natural to find another Mule Deer on the trail near Indian Garden, given the available source of water at the oasis, but this Deer was more interested in taking advantage of the shade it had found. That close to the oasis, there was an abundance of trees whereas the area surrounding Indian Garden, the Tonto Platform, supports only those plants typical of a desert environment…low scrub and cacti. 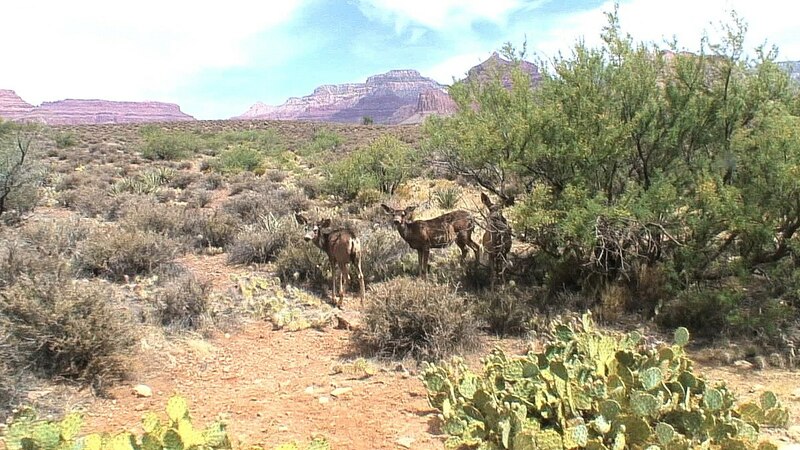 Mule Deer eke out a good existence in desert regions where there is sufficient vegetation to eat and to hide in. Only during the hottest parts of the summer months will the Mule Deer in the Grand Canyon move to higher elevations where they can find cooler temperatures, ample water and lush vegetation. The lower elevations maintain a warmer temperature during the winter months, so that is where most of the Mule Deer will be found at that time of the year. After taking a break at Indian Garden, Bob and I made the decision to carry on to Plateau Point, a lookout with a view of the Colorado River. We had to make haste as the afternoon temperature was at 100F and rising. 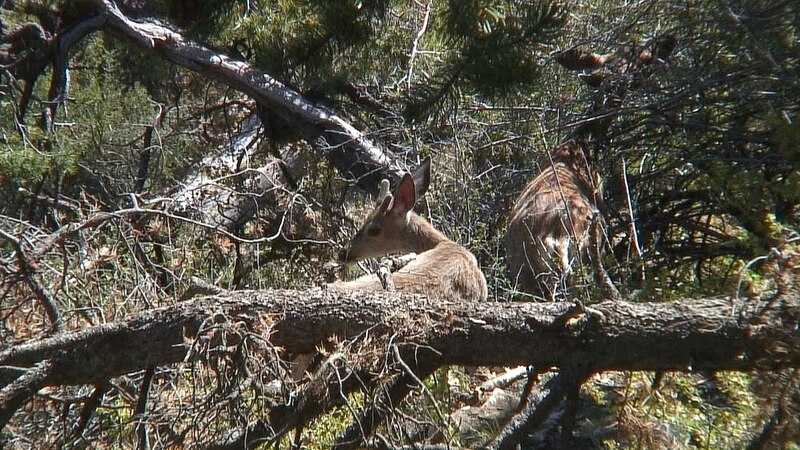 Already, a few Mule Deer were seeking refuge in the shade of a small tree. The young deer usually forage together in family groups, and then bed down in a cool secluded place during midday. The bucks, on the other hand, go off by themselves and are more apt to bed down on some rocky ridge to pass the afternoon hours. Mule Deer rarely travel far from water and forage, so there, not far from Indian Garden, made a perfect spot to bed down. For them, it was a short walk to the river running through the oasis. 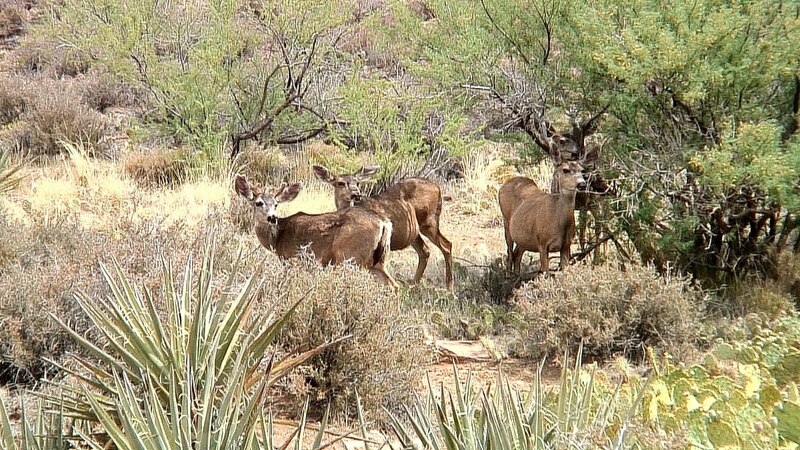 Mule Deer have adapted to living in the desert by keeping daytime activity to a minimum, thus keeping their body temperature within safe limits and conserving water. Other adaptations that contribute to their survival in a dry and harsh desert climate include the fact that their grey-buff coloured coats help camouflage them from predators in their sandy surroundings. With their keen sense of smell…1,000 times stronger than a human’s…, Mule Deer can detect water 2 feet underground, and specially adapted larger feet enable them to claw away the earth to reach the water. 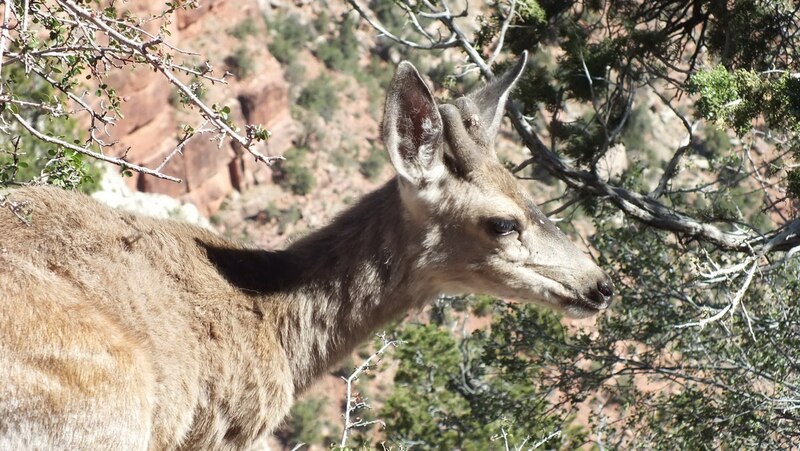 It was late spring when we traveled to the Grand Canyon, so the Mule Deer in the Inner Canyon had not yet been inclined to move to higher altitudes. They would wait until the daytime temperatures got even hotter. The day following our 13-hour hike to Plateau Point and back up to the South Rim, a road trip seemed in order. Our legs were in serious need of some rest so we set off for the North Rim, visible in the distance in this snapshot. After crossing back into Grand Canyon National Park on the North Rim, Bob and I drove through extensive meadowland on the Kaibab Plateau as we made our way towards Point Imperial. Seeing several Mule Deer in that alpine environment was more akin to seeing White-tailed Deer at home. Mule Deer are smaller, slower and less colourful than White-tailed Deer, ranging in size from 3-3.5 feet tall at the shoulder and from 4.5-7.0 feet long, with does being smaller than the bucks. 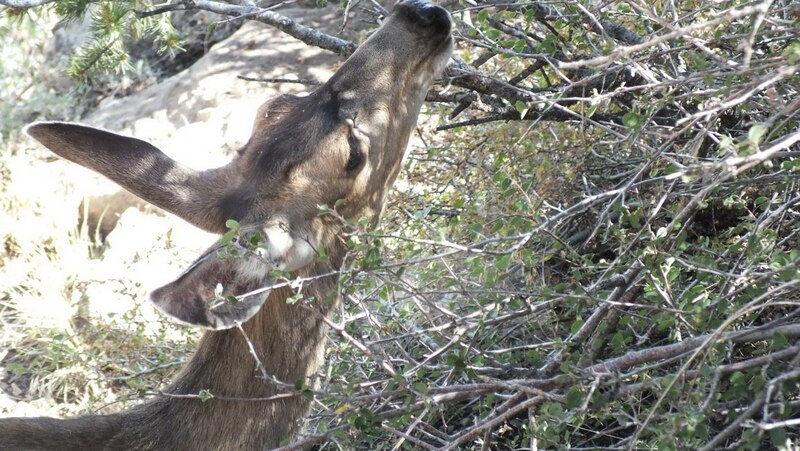 Mule Deer eat a wide variety of vegetation types in order to meet their nutritional needs, but because they have no upper teeth, only a hard palate, and because their digestive tracts are different from those of cattle and elk, Mule Deer must be quite selective in their food choices. Rather than eating large quantities of low-quality food like grass, they select the most nutritious plants and plant parts to meet their forage requirements. Like with a cow, food is digested after ingestion when the deer chews its cud. Considering the various locations where Bob and I had sighted the Mule Deer, we felt we had been very lucky. They are quite endearing with their large ears, and knowing how important they are to the wildlife food chain, Grand Canyon National Park is fortunate to have a healthy population living within its boundaries. A wonderful account accompanied by photos of your experience. Hi Daniel. I’m glad you enjoyed reading about our experiences. 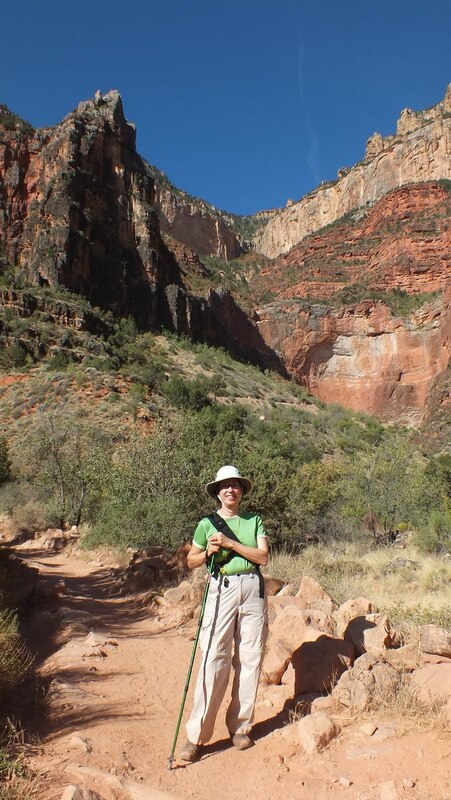 Bob and I like to challenge ourselves and so hiking the Bright Angel Trail was an obvious choice. It took us longer than most other hikers because we were detained every time we spotted a new bird or animal. It was very rewarding discovering new wildlife and capturing them on film. Good variety of not often seen birds for sure. Love that landscape. thanks for your comments, Paul. 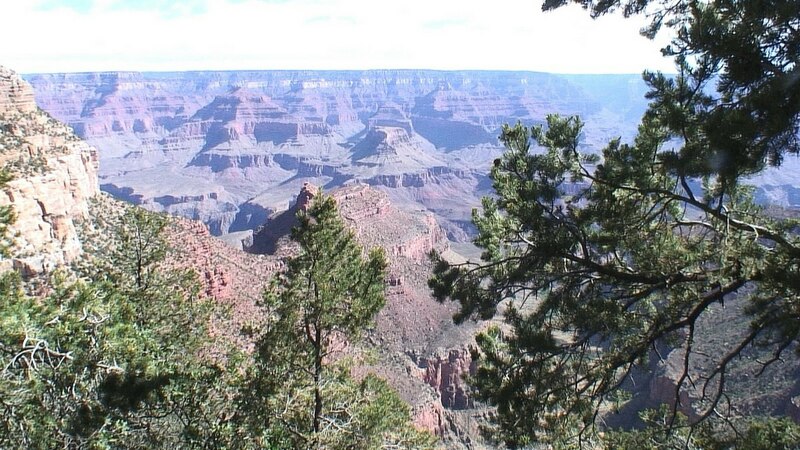 Before we went to the Grand Canyon, Bob and I didn’t give much thought to the wildlife that we would see there, so we were pleasantly surprised at the number of sightings we made. 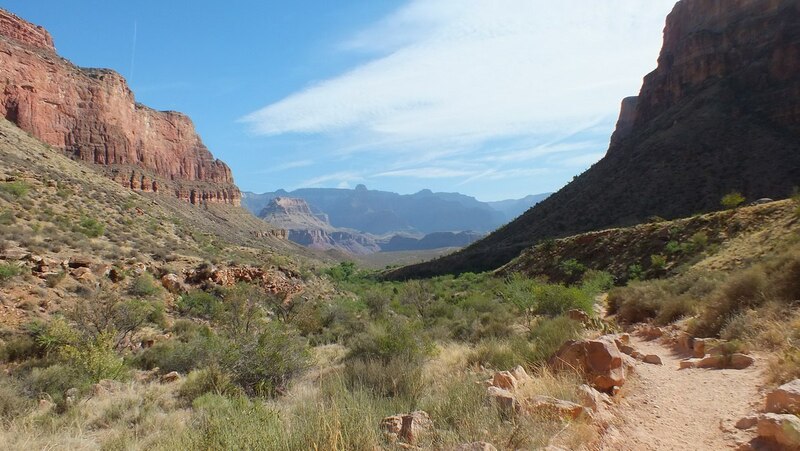 A great influence on the birds and animals is the dramatic change in temperature and vegetation at different levels of elevation between the Rim and the Inner Canyon. We thoroughly enjoyed our wildlife viewing.